Periodontal disease, or gum disease, is one of the most common medical condition in pets. According to the American Veterinary Dental College, most dogs and cats show some symptoms of gum disease by the time they’re three-year’s old. Luckily, our pet dentistry services for San Antonio pets and surrounding areas can prevent gum disease entirely. Professional dental cleanings will keep your pet’s mouth fresh and prevent gum disease from wreaking havoc on your pet’s teeth and gums. We provide complete pet dental care to offset the negative effects of gum disease. We provide routine dental examinations and anesthetized dental cleanings, as well as extractions and prophylactic antibiotics as needed. For your pet’s benefit, our team can also educate you on important at-home dental care techniques. Though it can be time consuming, it’s important to brush your pet’s teeth daily with a pet friendly toothpaste. It may be harder to brush your cat’s teeth and we can educate you on other at-home preventative measures as well. Please take advantage of savings we offer for pet dental examinations and cleanings. We want to keep your pet’s mouth healthy while saving you money at the same time. To do that, we offer a dental special all year-round. 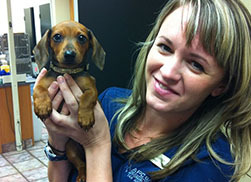 Here’s how it works: First, schedule your pet’s dental exam. Then, if you schedule a dental cleaning within two weeks from the exam date, you save $35 on the cleaning and you get a free dental treat. It’s that simple! Call (210) 735-2273 today to schedule your pet’s dental examination.